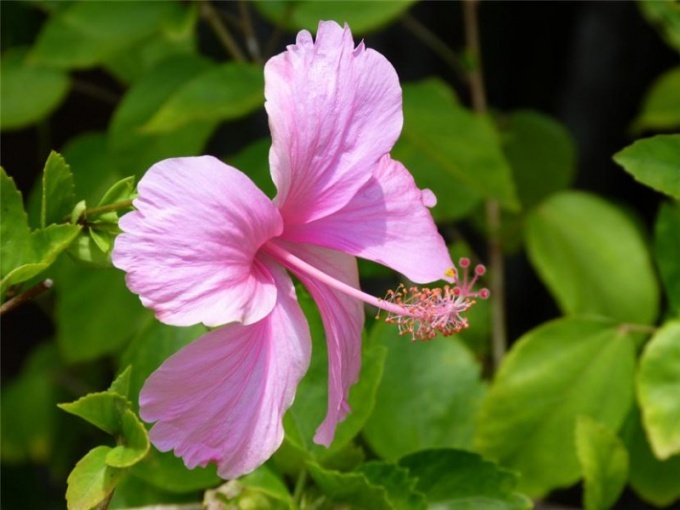 China rose or Hibiscus is a plant of the family Malvaceae, which unites 250 species comes from tropical Asia. In Hawaii it is called the "flower of love" and the local girls often decorate their hair. In Europe, the flower has appeared about 200 years ago, immediately won the sympathy of gardeners. China rose does not require complex care, likes light (not direct sunlight) and moisture, to propagate Chinese rose in three ways:Propagation by cuttings with a length of 10-15 cm In the late summer cuttings of cut roses. The slicer have to do with the angle. Leave the cuttings 2-3 leaves and plant in pots with prepared soil mixture of peat and leaf soil and sand, taken in equal proportions. Cover the cuttings banks. Flowers will root in 2 weeks. This is a way to copy Chinese rose can be used in another embodiment. Cut off a few young shoots of roses and put them in water. After waiting 2-3 weeks until the cuttings will root, boldly planted them in pots. Plants planted in this way grow slightly worse than in the first embodiment. Propagation is air layering:This method is good because they can be propagated cuttings are not small, and large, stiff branches. By selecting a location on the branch for future roots, tear off about it all shoots. With a sharp knife, remove the bark from the branch in the form of a ring width of about 1 cm Slice anoint the growth powder. Below the treated area tied to the branch of a large piece of transparent film. You can use a band-aid or duct tape. In the film roll in the ground, well moisten with water. The upper edge of the film is also tied to the branch above cut so that it was in the ground. Always check that the ground in the bag was wet. When the lump will sprout good roots, and it will take about 2 months, carefully cut it just below the roots and plant in a large pot, warm it well. Propagation by seeds:This method is not suitable if you want to propagate Chinese rose Terry varieties. Seeds can be stored in paper bags for about 3 years. In the spring in pots with prepared soil wisata 3-4 seed rose to a depth of 3 cm, pour. Rose seeds germinate well and do not require special care except watering. Hibiscus (or China rose) belongs to family Malvaceae. This is a beautiful shrub, blooming krupali flowers that can be both simple and double forms. To propagate Chinese rose in several ways: by sowing seeds, cuttings and division of the Bush. To propagate the plant by seed is quite simple, besides it is possible to obtain a large number of new plants. Hibiscus seeds are sown in the winter in late January — early February. Before planting, seeds need to be soaked. Lay them on a damp cotton cloth and cover with a damp material. For planting, prepare the lightweight soil based on sand and peat. Also, the mixture you can add chopped sphagnum moss. Fill with soil plastic cups and moisten it. Plant seeds in moist soil. Put in a plastic bag, tie it and place the greenhouse in a warm and Sunny location. In favorable conditions seedlings appear in a week. After this package can be removed, and when the young hibiscus will appear 3 true leaves, they need to raspikirovat in individual pots. After 3-4 months the hibiscus can be planted in a permanent place. Despite the fact that this method is fairly simple. He has a number of disadvantages. First, the flowering of young plants grown from seeds will come in a few years. And second, the new plants may not replicate the quality of the parent instance. For example, instead of Terry flowers, you can get a simple. 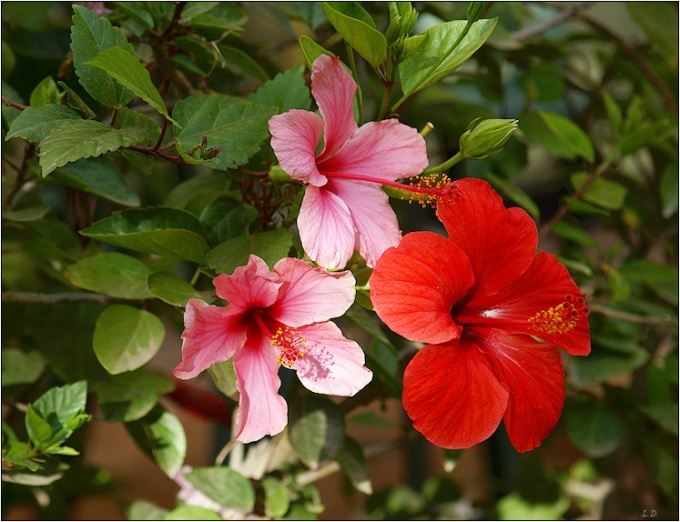 To a plant fully repeated qualities of the mother, the hibiscus is propagated by cuttings or division of rhizomes. Cuttings provide the most predictable results, but to root them quite difficult. You need to be very large number of planting material. As cuttings for propagation of hibiscus take shoots remaining after pruning. It can be done at any time of the year but the best time for grafting is early summer. Cut the cuttings a sharp clean blade at an angle. The optimal length is about 10 cm, in addition, the handle should be 2 or 3 leaves. Rooting cuttings can be prepared in water or in soil. In the first case, place cuttings of hibiscus in a container filled with settled water at room temperature. The top cover all the other transparent container or plastic bag. It is necessary to create a certain humidity. Ventilate the greenhouse daily and change the water in the tank every few days. Already after 7-10 days, you should see the first roots, however, usually only a few rooted cuttings. Plant cuttings with roots in individual pots filled with a mixture of sand and peat. Put them in a bright place, occasionally watering. When rooting cuttings in the ground hibiscus grow more healthy and strong. Remove the stalk with all the leaves, leaving only the top 2 and put them in prepared moist soil. Cover the cuttings cut off a plastic bottle and leave for a few days. At this time, periodically ventilate the greenhouse and water the plants. The hibiscus is propagated this way, can bloom in the first year. The easiest way is to divide the rhizomes. The old plant out of the pot. The earth shake and divide hibiscus in 2-3 pieces. Damaged roots sprinkle of crumbled charcoal. Will plant them out in a separate container and moisten. Put in the shade for a few days, and then move the hibiscus in a Sunny location and care as usual. The only drawback to this method is that it will result in a small number of new plants.